Last week kicked off the 2016 state legislative session, and it’s clear we have a lot of work ahead of us. 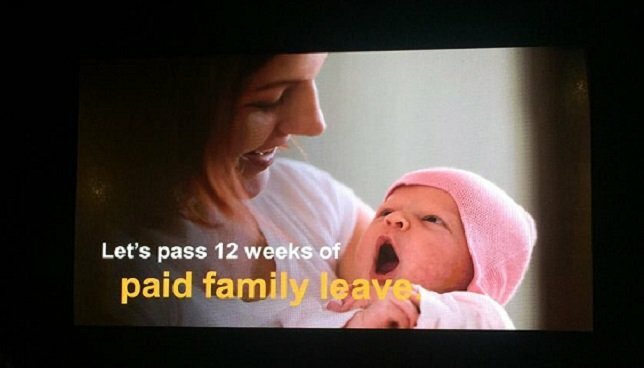 Paid family leave policy for working men and woman is an issue the Assembly Majority has long supported, and it's time for the Senate to finally get on board. Photo by: Michaelle Solages, via Facebook. Valley Stream, NY - January 15, 2016 - Last week kicked off the 2016 state legislative session, and it’s clear we have a lot of work ahead of us. The quest for a stronger New York starts with identifying what families need to succeed, then delivering. To me, that means increasing opportunities and fairness so that everyone can get ahead and no one is left behind. This idea starts in our schools. Children deserve every opportunity to succeed in life and that means strong schools. My focus is on continuing efforts to smartly reform our public education system where it’s needed, along with greatly increasing school aid. It’s important to recognize that factors both inside and outside of the classroom can have an impact on a student’s academic success; no reform can ignore that reality. Another issue is the burden that parents are shouldering when it comes to the ever-elusive work-family balance. New York must enact a paid family leave policy that gives working men and women the option to stay home with a new child or to care for a sick family member without risking their job or financial security. The Assembly Majority has long supported this vital policy, and it’s time for the Senate to finally get on board. That brings us to economic fairness. The key to increasing fairness in New York is to reform the tax code and raise wages. We can start by making permanent tax cuts that benefit working families while asking those at the top to pay a little more. We must also significantly raise the minimum wage to not only help those at the bottom who are working full time but are stuck in poverty, but to also push wages up for everyone else. With the inequality gap as wide as it is, bold moves are needed and half-measures must be pushed aside. We also need to continue to invest in our communities and increase job opportunities. One way to do that is by improving our infrastructure – repairing crumbling roads and bridges while also creating good-paying local jobs. And, to spur more economic growth, we must keep finding ways to make New York more business friendly and help small businesses thrive – they are the engines that drive our economy forward. Finally, we have an opportunity to restore New Yorkers’ faith in our government. While the Assembly Majority passed significant reforms last year increasing transparency and accountability, we need to go further. I’ll keep fighting to close the LLC loophole so that giant corporations can no longer make practically unlimited secret donations. And, we must strip the pensions of corrupt elected officials – taxpayers should not be on the hook for a crook’s retirement. These are just a few of the many goals I have for the 2016 legislative session. I look forward to working with our partners in government to make them a reality – it’s the right thing to do so we can help ensure a brighter future for our state and for all New Yorkers. As always, if you have any questions about this or any other community issue, please don’t hesitate to reach out to my Chief of Staff, Sophia James via email at or call 516-599-2972. Subject: LongIsland.com - Your Name sent you Article details of "Assemblywoman Michaelle C. Solages: In 2016, Let’s Work to Increase Opportunities, Fairness For All New Yorkers"